Last Updated Mar 12, 2019. Dream feeding is one of those terms that gets tossed around so much that everyone assumes that everyone else knows the exact meaning of the term. Yet when you dig a little deeper, you realize that people have WILDLY different definitions of the same exact term! So What Is a Dreamfeed? Just so everyone is on the same page, a dream feed is when a parent goes to their sleeping infant, picks them up to breastfeed (or props them up either in their crib, or in a caregiver’s arms, to offer a bottle), feeds the child, and then puts them back down *asleep* without the baby ever having woken up. A dream feed is NOT a dream feed if a child opens their eyes at any point in the process, or if the feeding is in response to a child waking up. Generally speaking, a dream feed is done between the hours of about 9:30pm and 12:00am. Technically, if all other terms are met, but the feed is done outside of these hours, the feeding is still a dream feed. Dream feeds are a great tool from birth (or a few weeks after, when babies are not quite so sleepy), through to when a baby is done being swaddled. It is very challenging to dream feed a baby, even a very young one, without waking them up if they are not swaddled. Generally speaking, it’s wise to stop dream feeding around 14–16 weeks of age, because after this age babies become a lot more awake and aware, and dream feeds tend to disrupt the rest of their overnight sleep. Check out my Newborn Sleep Program! I like dream feeds for young babies not because they necessarily prevent babies from waking up to eat at night, though sometimes this is the case, but more so because I appreciate the “insurance policy” of extra calories at night. As long as a baby is young enough that the dream feed itself does not wake them and fracture their remaining nighttime sleep, doing a dream feed can insure that they are getting as many calories as possible during each 24-hour period. Some babies respond beautifully to a dream feed, especially those with reflux! From about 7pm on through to about 2 or 3am, the body is flooded with the melatonin. Melatonin is responsible for many things, chief amongst them making the body feel drowsy and relaxing the long muscles (abs, legs, and arms). Since the abdominal muscles are relaxed, it’s common for babies with a lot of reflux to tolerate a dream feed without spitting up, and possibly without needing to be burped or held upright afterwards. I can speak to this from personal experience with my own extremely reflux-y, wholly unmedicated daughter. Since the concern for calorie intake is so high with reflux babies, dream feeds can be especially useful for them. If you feel your sleeping baby needs to be burped, go ahead and attempt to burp them as you normally would during the day. Check in with your pediatrician to ask how long to attempt a burp for, before giving up and putting baby back to sleep. The bottom line is that a dreamfeed, if understood for what it truly is and if done correctly, can benefit baby AND parents by offering an extra dose of nutrition and helping baby sleep (and parents too)! 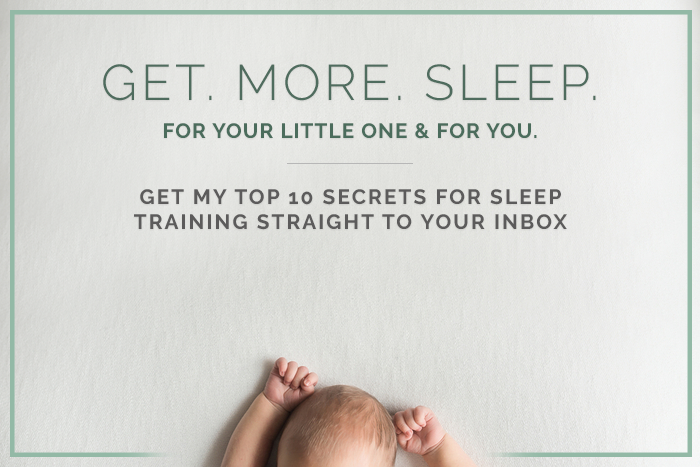 If you like staying in the know with the most up-to-date information, and learning everything you can about your little one’s sleep, please sign up for my newsletter using the button below! You enter their room (keeping it dark! ), and prop baby up either in their crib, or holding them in your arms, and immediately start feeding them the breast or bottle. You should stop attempting dreamfeeds when baby starts to sleep unswaddled (or around 14-16 weeks old when these feeds can start to become disruptive to their nighttime sleep). If you want to learn everything I know about babies under 16 weeks, check out The Newborn Sleep Program, and give your newborn (and yourself) the best possible sleep. And if your baby is older than 16 weeks old, and you’re looking for affordable, hands-on sleep training support, check out my online training series, The Baby Sleep Trainer Program + Support. Use the code DFbaby for 10% off either program. Hey!! If you can keep a DF and it doesn’t cause any issues, that’s great. Typically after 4 months of age the DF just becomes another waking that baby starts to have. I would get an okay from the doc on when it’s okay to cut all night feeds, then stop the doing the DF (if you’d like). Also, the DF can actually wake the baby (they make look asleep, but it really does rouse them a bit when you feed them) and that waking can cause issues with the rest of their night’s sleep. Hi! i need some help! My LO is 16 weeks and we started doing a DF about 2 weeks ago. She goes to bed at 7pm (she can put herself down to bed, we sleep trained and she learned that one rather quickly) and we DF around 1045pm. But she won’t sleep past 4am and lately she has been waking at 3am! We let her cry about 30 min then go in to soothe her and then she will sleep until 7am. Has the DF disrupted her sleep cycle? Am I destined to wake up in the middle of the night forever?? Should I go back to the way it was before? Before, she would sleep from 7pm to about 1am and then feed and then wake again around 5am. The DF has allowed me to get a much-needed 4-5 hour uninterrupted stretch of sleep. help! Hi thanks for the help, my question is- can I leave the baby in the rock n play for the dream feed or is it necessary to pick her up? She has reflux very bad. Is on Zantac 3x a day. So I am curious to see if this will work and want to give it a try. Hi Melanie! It is not necessary to pick baby up if she’ll take a bottle. Simply prop her up (if needed) and feed her the bottle where she’s sleeping without waking her.